A stunning colt by Golden Slipper producing sire Medaglia d’Oro topped the opening day of the Magic Millions National Weanling Sale on the Gold Coast today. 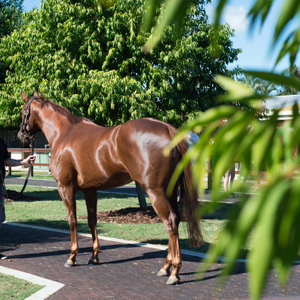 Leading bloodstock agent James Harron went to $500,000 to secure the colt, offered as Lot 101, a part of the quality packed Wood Nook Farm Dispersal. 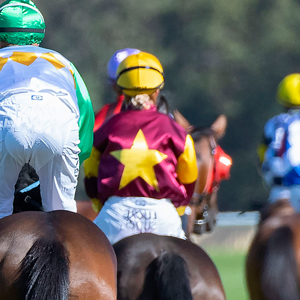 He was the star seller on a day when quality lots helped return a record average price of $61,628 – up over 41 per cent on last year’s buoyant opening day whenyoungsters from Teeley Assets starred. 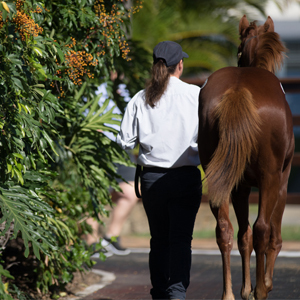 Today’s top seller, from the black type performed and producing Redoute’s Choice mare Starfish, highlighted a run of four consecutive lots from Wood Nook Farm to sell for over $200,000. The others in that streak were Lot 108 (Fastnet Rock-Oh Goodness Me filly for $220,000), Lot 109 (Pierro-Rocha colt for $300,000) and Lot 110 (Fastnet Rock-Slapstick filly for $280,000). 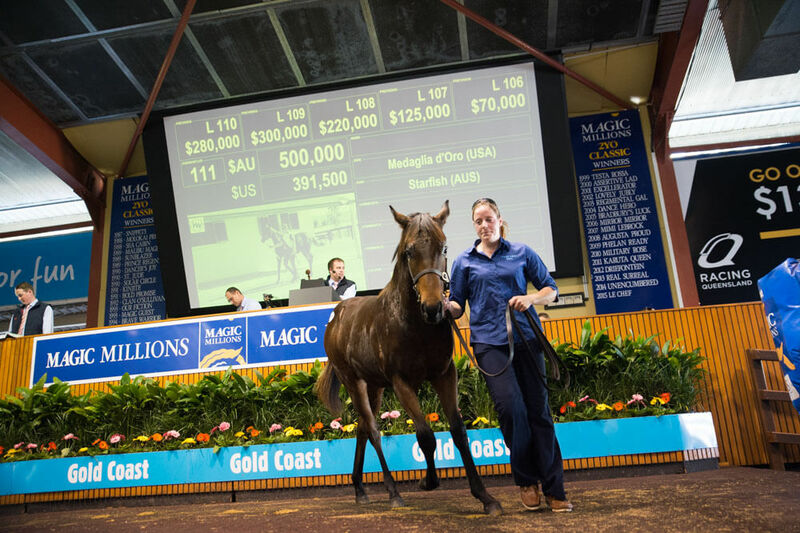 “He’s an exceptional colt,” James Harron said of the $500,000 Medaglia d’Oro youngster. “He was a stand out for us and I’m pleased to have got him,” Harron added. The day’s second top seller was the Pierro-Rocha colt from Wood Nook Farm who was purchased by Segenhoe Thoroughbreds for $300,000. 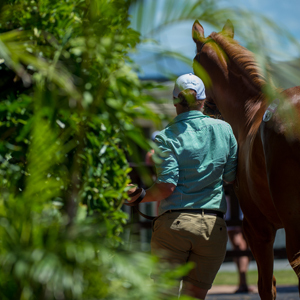 “He probably made a bit more than we wanted to pay, but in this market the good types with the pedigree are popular,” Segenhoe’s Peter O’Brien said. “We like Pierro and we’re delighted to have him.” O’Brien added. First season sires Pierro and All Too Hard were top rivals on the track and they are now doing it at stud. Both sires had exceptional days with Pierro average $196,667 for six sold, while the five weanlings by All Too Hard sold average $180,000. During the day over $8.77 million was given for 142 lots sold at an average price of $61,768 – an increase of over 40% on last year’s sale and over 70% on the sale in 2013. To view the results, online catalogue and to make an offer on a passed in lot click here. To view a video review of Day One click here. 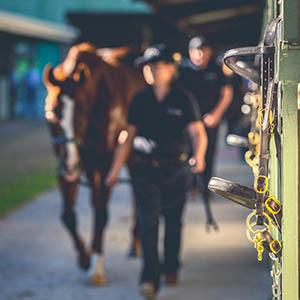 Day Two of the National Weanling Sale will commence at 10am tomorrow (Monday).